Originally published on Finding Todd. 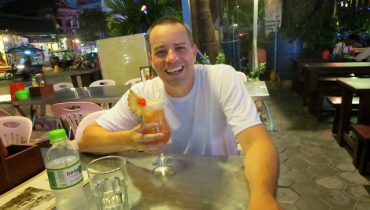 The following happened during my trip to southeast Asia. 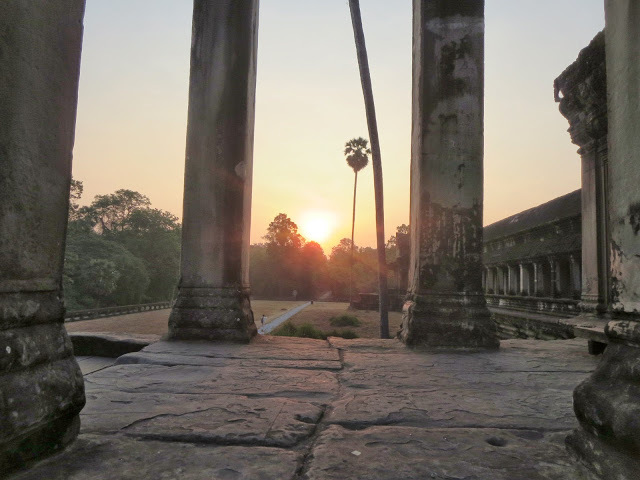 After having to delay it for a few days due to dehydration, I finally was able to see the sunrise at Angkor Wat in Cambodia. My 10pm bed time last night eventually changed to midnight as I just couldn’t sleep. I think part was due to me being cooped up in the room lying in bed all day. Another part was my mind racing trying to figure out different stuff with the next part of my trip. And then there was the part that was excited about finally getting back on track and getting out on my adventure again after being set back by two days because of my illness. I dragged myself out of bed at the ungodly hour of 4am to get ready for my 5am pickup to go see the sunrise over Angkor Wat. Even though I only had a handful of hours sleep and I was still on the mend I was pumped and ready to go! 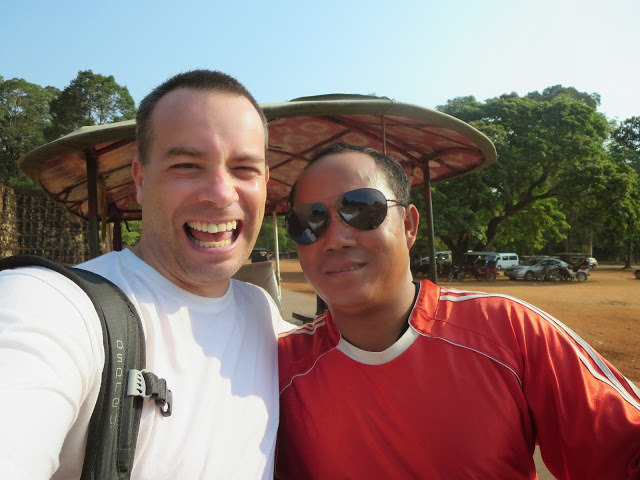 My tuk tuk driver, Mr. Cheun was waiting for me outside and he was as happy to see me as I was to see him. 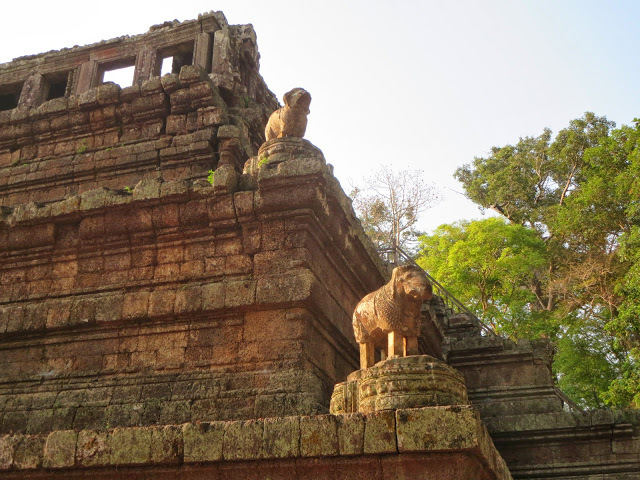 He had been the driver to pick me up at the airport the other day – a free service the hostel offers – and I had told him that I would go with him to the temples. Then I had to postpone. He knew what was happening with me and was even there when I was being driven off to the clinic the other day, but still, it must have sucked for him to keep getting postponed on. I genuinely felt really bad that I was doing this to him even though it really wasn’t something in my control. 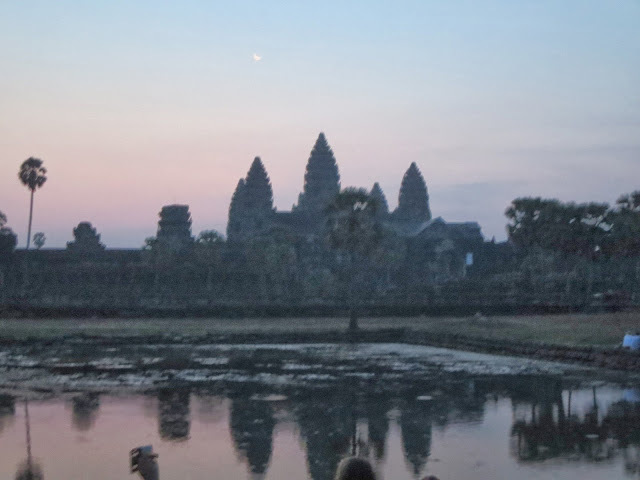 Oh yes, two happy people at 5am – time for a leisurely half hour tuk tuk drive through the dark and relatively empty streets to Angkor Wat. As we turned down the roads out of the city it soon became apparent I was not the only one going to see the sunrise as a procession of tuk tuks were heading the same way. 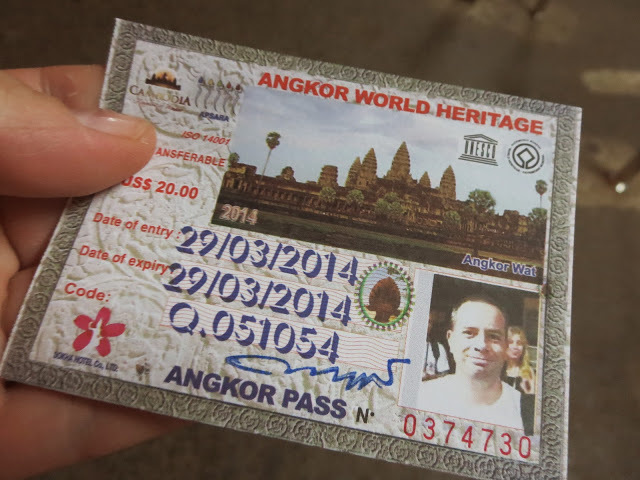 I stopped at the ticket booth which is actually about a 10 minute drive away from Angkor Wat and paid my $20 for a one-day pass. The other alternatives are $40 for 3 days or $60 for a week long pass. 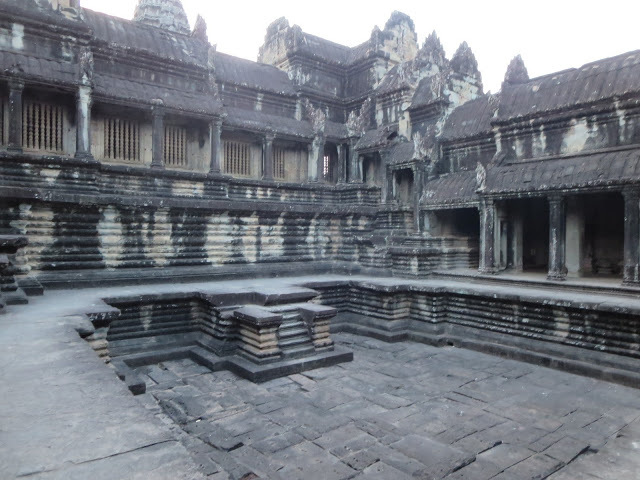 We arrived to Angkor Wat around 5:30am. 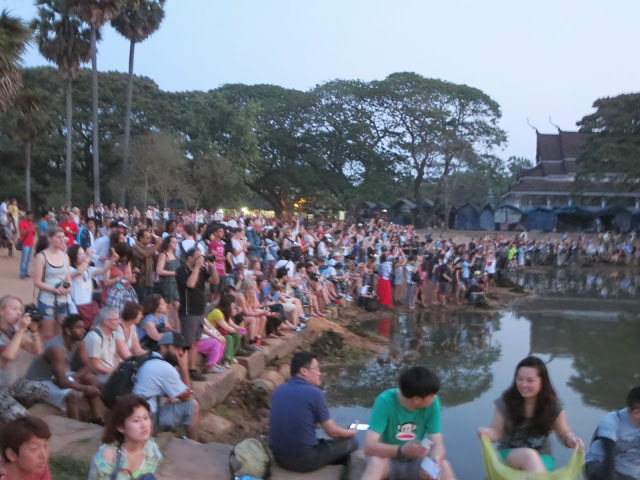 It was still dark out but you could see the hundreds of people standing by the lake outside the temple waiting for the sunrise. Hundreds, I kid you not. The ones in the front all had their tripods set up, some were using one of those color cards to determine, ah, whatever, they were professionals I guess but probably just really, really hyped up amateurs. It has been awhile since I’ve been bombarded by people trying to sell me things but that was the case today. I guess it shouldn’t come as a surprise seeing as how touristy the whole thing is. It was a shame though that most of the people doing it were little kids. Do you want a guide? A guide book? Water? Coffee? How about some hand woven thing-a-ma-bob? You buy something sir? Sir? Where are you from? 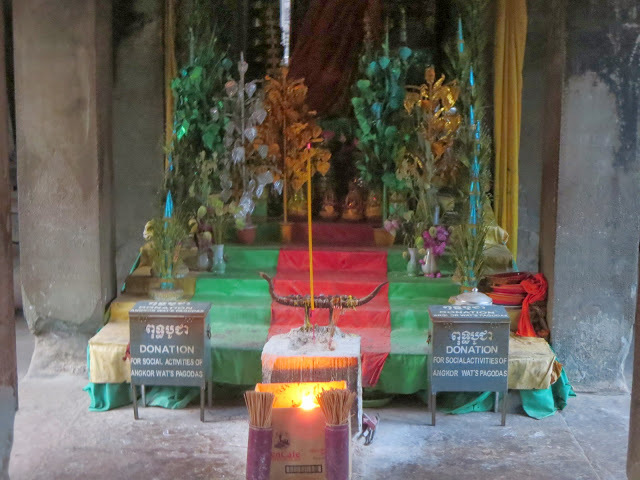 My favorite though is every time I would enter a temple today there would be someone on the inside waiting with incense sticks trying to hand them to me so I could plant them in the ash jar next to the makeshift shrine. Good luck, sir, good luck. The temples have certainly created alot of jobs for the locals which is a good thing. Do I like being bombarded by people for stuff? No, of course not – but you have to appreciate that they’re just trying to make a living. Along with all the touts selling things there are also people working alongside the roads and temples brushing away leaves and dirt from the roads and pathways. I’m assuming that’s where part of my $20 entrance fee goes. And let’s not forget the tuk tuk drivers. This is a thriving business for them. 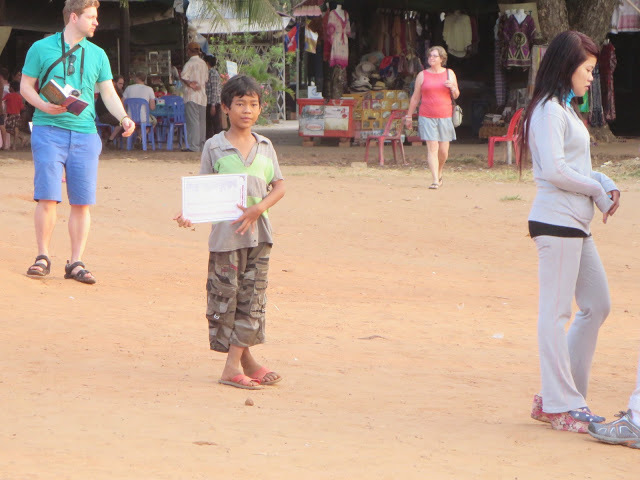 Dozens and dozens collect the standard $15 all day rate to drive us around to the different temples and wait for us. I’m pretty sure that’s why they partner up with the hostel to give us free rides from the airport just so they can hopefully get some business from us while we’re here in town. I hope this doesn’t come across as complaining because I’m not. I just like to stand back and look at the big picture. 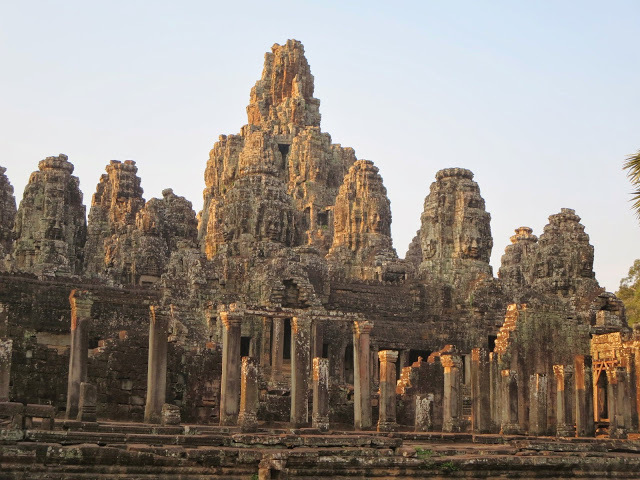 These temples and us tourists make this city thrive. We drive their economy big time. I was more than happy to support Mr Cheun after he picked me up at the airport and waited for me for 3 days to finally get out there. Around 6am the sky started to brighten. The sun hadn’t officially risen but it was now bright enough to look around. 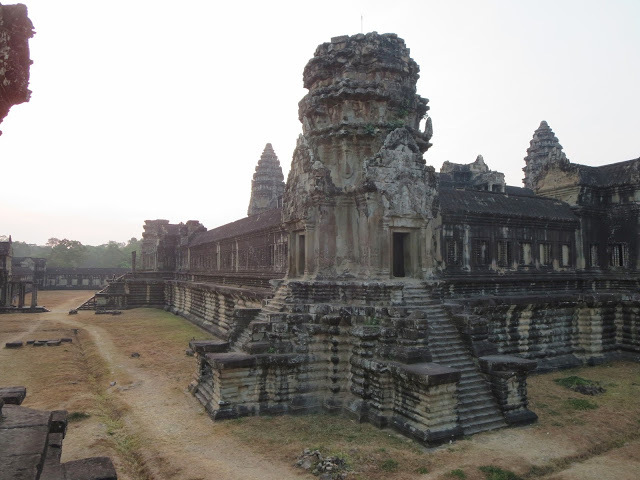 I took a few photos of the almost sunrise and decided instead of waiting another half hour for the real thing I’d get a jump start on the massive crowd and start exploring the temples early. This turned out to be the smartest idea I had all day as I was ahead of the crowds most of the day and was able to explore in peace and quiet. If you’ve read my blog then you know about my experience in Granada, Spain last year with crowds – I hate them! 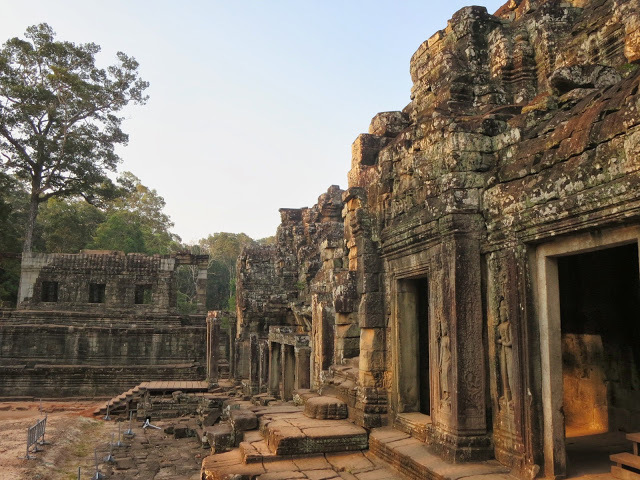 A few people had told me ahead of time that Angkor Wat, although the most popular and famous of the temples, wasn’t that great and, in fact, the smaller ones were much better. Well, turns out, that opinion is very valid. 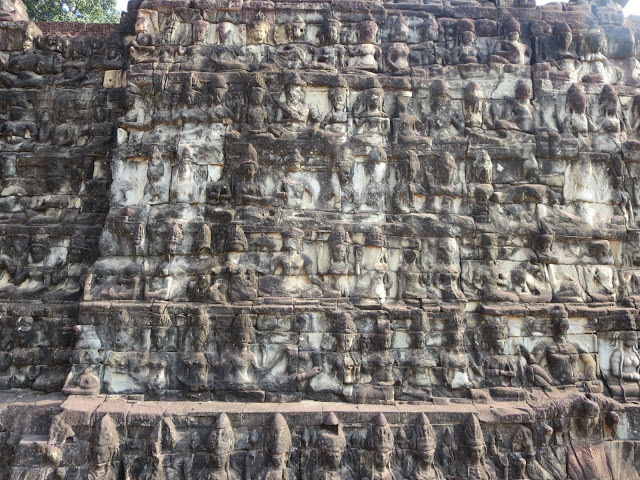 Not that Angkor Wat isn’t grand and impressive but it didn’t move me the way the other temples did. 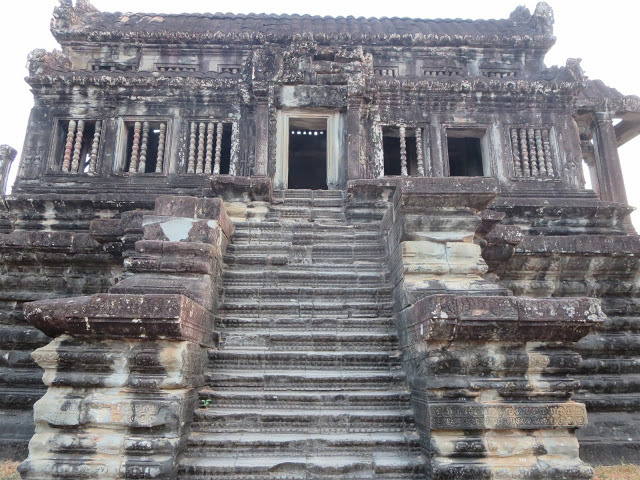 I walked around the outside of the massive temple but couldn’t find a way inside as all the entrances were roped off. I saw a guard letting people past a rope to climb up to the top so I joined that line. Turns out he was letting them up there to see the sunrise. And for 5 bucks. I asked him if it opens up for the public at some point and he said 6:40 so I guess they make their money and then let us in. 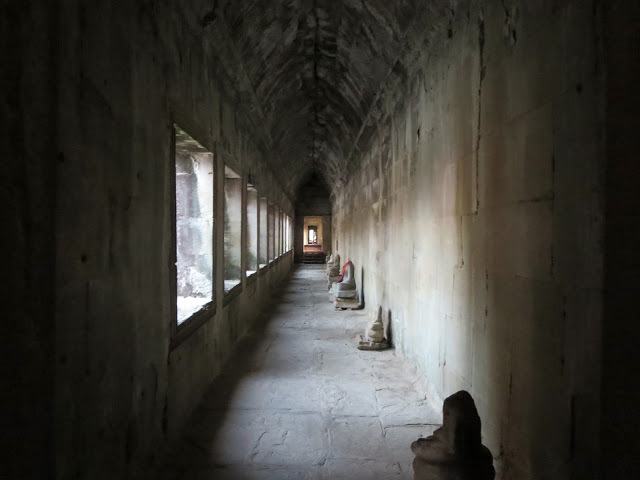 That was still awhile away and I didn’t really want to hang around and wait for the crowds to join me so I decided instead to head out of Angkor Wat and meet up with Mr. Cheun to get to our next stop. As I was heading out of the temple area back I looked over my left shoulder and there it was – the sun had risen a bright red in the sky. Even though I wasn’t high atop the temple or standing with everyone else by the lake outside I still took time to marvel at the beauty of it. 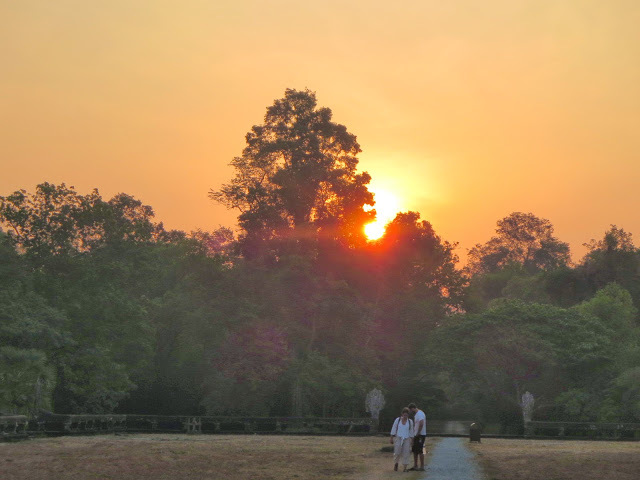 So, did I see the sun rise at Angkor Wat? Damn straight I did! And it was beautiful! As I exited the gate I passed the huge crowd that was slowly packing up and moving their way past me to go inside. I smiled to myself – Best. Decision. Ever! 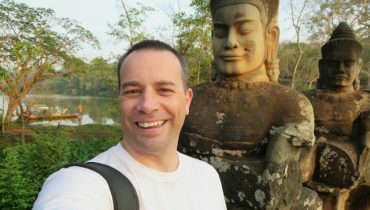 Mr. Cheun was waiting for me and at 6:45am we went to our next stop – Angkor Thom. 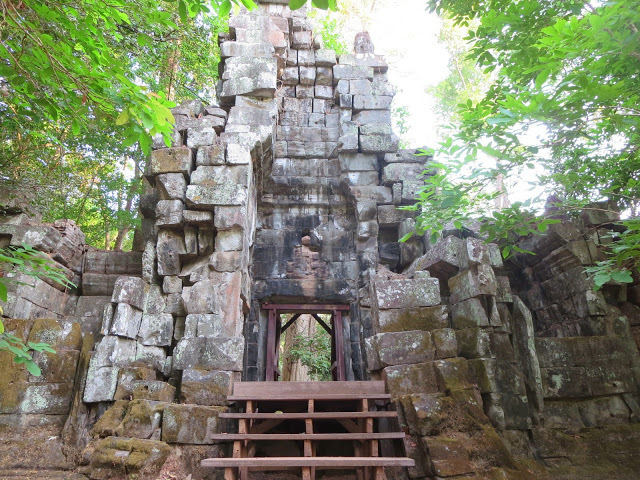 This is a really cool stop as there are several temples and buildings to discover as you walk along the lands for an hour or so. 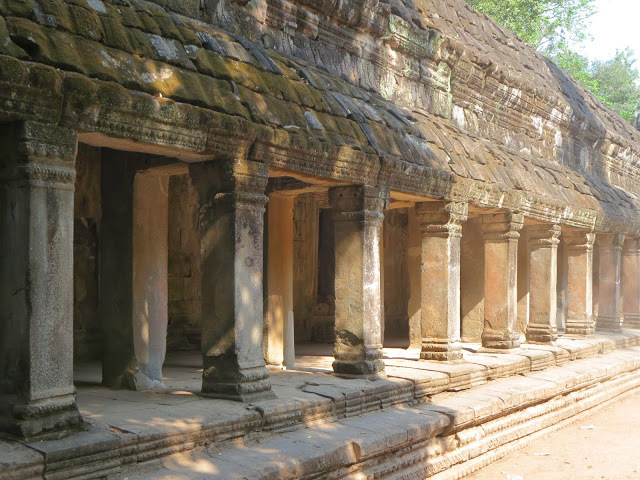 There are 2 temples, 2 pagodas and 3 terraces all within walking distance of each other. By now I had gone through my first bottle of water and, in fact, my the end of my temple hopping tour today I went through 3 more – no more dehydration for this boy! I walked through the forest amoungst the architectural marvels completely alone. I mean, there was nobody around! It was so perfect, quiet and serene. 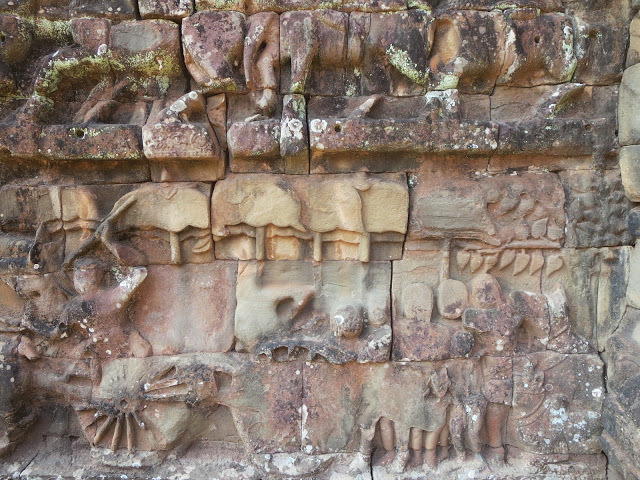 My favorite of all the things I saw at Angkor Thom was the Leper King Terrace (don’t ask me why it’s called that). 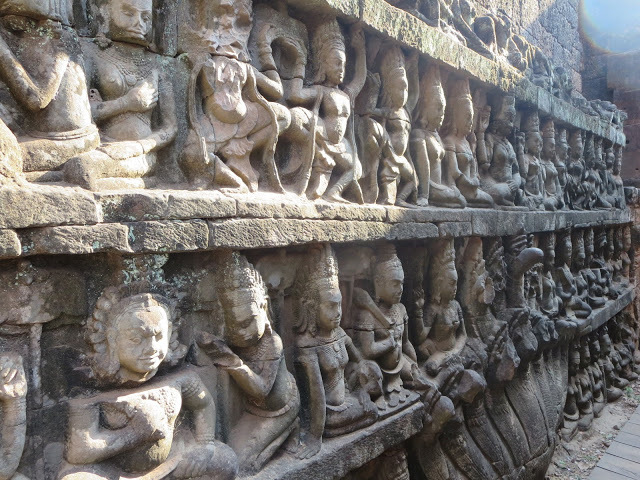 The carvings in the wall were stunning and you just had to appreciate the craftsmanship that went into putting it all together. In fact through the whole morning I couldn’t stop taking photos and easily took more photos in one day than I ever had – over 200. And that was before 9am! 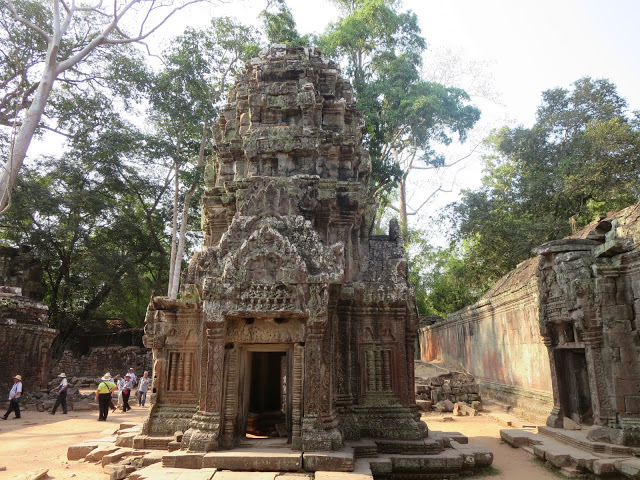 I met with Mr. Cheun again to go to our next and final stop for the morning – Ta Prohm. 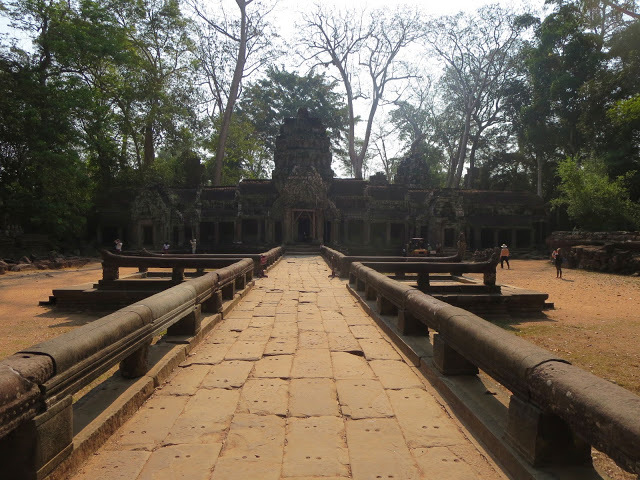 There are many more temples to see (hence the 3 day and week long passes) but these were the 3 popular ones. I could have seen more today if I wanted to but I had a bus to catch at 12:30 and, frankly, after the last couple of days I wasn’t sure if I’d be able to make it 6 or 7 hours like most people do on their one day excursions. 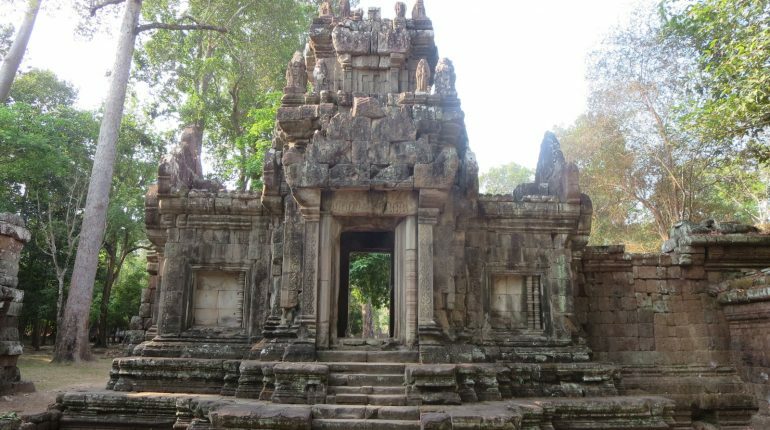 We pulled up to Ta Prohm after a short ride and once again Mr. Cheun waited for me as I entered the temple best known as that Tomb Raider place. 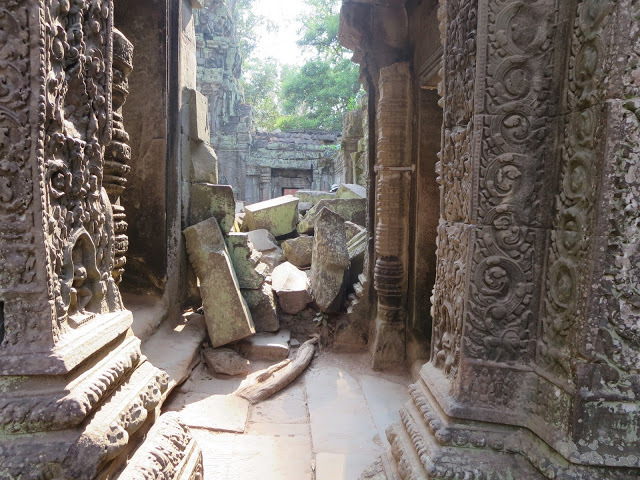 Yup, this is where they filmed a big chuck of the Tomb Raider movie. Click. Click. Click. Photos galore. So much beauty I could have stayed all day taking photos are soaking it all in. But, tick, tick, tick… the clock was ticking. It was 9:30 when I exited the gate and found Mr. Cheun and I was back at the hostel just before 10am. I paid my faithful driver his $15 plus another $5 just because I really did feel bad for leaving him hanging for 2 days. I was hot and sweaty and just wanted a nice shower before I leisurely took my time to pack and be ready for my 11:30am pickup to the bus station. As I was about to head upstairs I remembered that the breakfast buffet was free for people staying in private rooms. 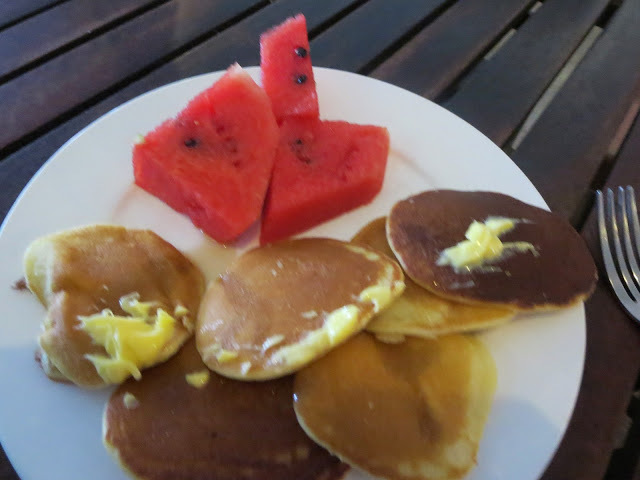 So, I grabbed a plate and munched on some mini pancakes and watermelon before they cleared away the buffet just minutes later. And that was my morning! Unbelievable that by 10am I had done so much already and still had the whole day ahead of me.